Florida (/ˈflɒrɪdə/ ( listen); Spanish for "land of flowers") is the southernmost contiguous state in the United States. The state is bordered to the west by the Gulf of Mexico, to the northwest by Alabama, to the north by Georgia, to the east by the Atlantic Ocean, and to the south by the Straits of Florida. Florida is the 22nd-most extensive (65,755 sq mi or 170,300 km2), the 3rd-most populous (21,312,211 inhabitants), and the 8th-most densely populated (384.3/sq mi or 148.4/km2) of the U.S. states. Jacksonville is the most populous municipality in the state and the largest city by area in the contiguous United States. The Miami metropolitan area is Florida's most populous urban area. Tallahassee is the state's capital. Florida's $1.0 trillion economy is the fourth largest in the United States. If it were a country, Florida would be the 16th largest economy in the world, and the 58th most populous as of 2018[update]. In 2017, Florida's per capita personal income was $47,684, ranking 26th in the nation. The unemployment rate in September 2018 was 3.5% and ranked as the 18th in the United States. Florida exports nearly $55 billion in goods made in the state, the 8th highest among all states. The Miami Metropolitan Area is by far the largest urban economy in Florida and the 12th largest in the United States with a GDP of $344.9 billion as of 2017[update]. This is more than twice the number of the next metro area, the Tampa Bay Area, which has a GDP of $145.3 billion. Florida is home to 51 of the world's billionaires with most of them residing in South Florida. 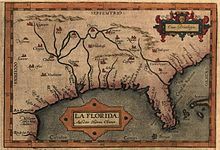 The first European contact was made in 1513 by Spanish explorer Juan Ponce de León, who called it la Florida ([la floˈɾiða] "the land of flowers") upon landing there in the Easter season, known in Spanish as Pascua Florida. 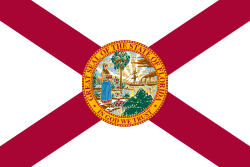 Florida was a challenge for the European colonial powers before it gained statehood in the United States in 1845. It was a principal location of the Seminole Wars against the Native Americans, and racial segregation after the American Civil War. Today, Florida is distinctive for its large Cuban expatriate community and high population growth, as well as for its increasing environmental issues. The state's economy relies mainly on tourism, agriculture, and transportation, which developed in the late 19th century. 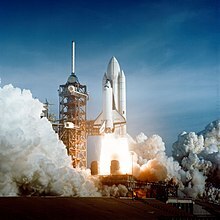 Florida is also renowned for amusement parks, orange crops, winter vegetables, the Kennedy Space Center, and as a popular destination for retirees. Florida is the flattest state in the United States. Lake Okeechobee is the largest freshwater lake in the U.S. state of Florida. Florida's close proximity to the ocean influences many aspects of Florida culture and daily life. Florida is a reflection of influences and multiple inheritance; African, European, indigenous, and Latino heritages can be found in the architecture and cuisine. Florida has attracted many writers such as Marjorie Kinnan Rawlings, Ernest Hemingway and Tennessee Williams, and continues to attract celebrities and athletes. It is internationally known for golf, tennis, auto racing, and water sports. Several beaches in Florida have turquoise and emerald-colored coastal waters. About two-thirds of Florida occupies a peninsula between the Gulf of Mexico and the Atlantic Ocean. Florida has the longest coastline in the contiguous United States, approximately 1,350 miles (2,170 km), not including the contribution of the many barrier islands. Florida has a total of 4,510 islands that are ten acres or larger in area. This is the second-highest number of islands of any state of the United States; only Alaska has more. It is the only state that borders both the Gulf of Mexico and the Atlantic Ocean. Much of the state is at or near sea level and is characterized by sedimentary soil. Florida has the lowest high point of any U.S. state. The climate varies from subtropical in the north to tropical in the south. 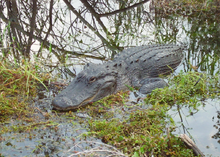 The American alligator, American crocodile, American flamingo, Roseate spoonbill, Florida panther, bottlenose dolphin, and manatee can be found in Everglades National Park in the southern part of the state. Along with Hawaii, Florida is one of only two states that has a tropical climate, and is the only continental state with either a tropical climate or a coral reef. The Florida Reef is the only living coral barrier reef in the continental United States, and the third-largest coral barrier reef system in the world (after the Great Barrier Reef and Belize Barrier Reef). The British governors were directed to call general assemblies as soon as possible in order to make laws for the Floridas, and in the meantime they were, with the advice of councils, to establish courts. This was the first introduction of the English-derived legal system which Florida still has today, including trial by jury, habeas corpus and county-based government. Neither East Florida nor West Florida sent any representatives to Philadelphia to draft the Declaration of Independence. Florida remained a Loyalist stronghold for the duration of the American Revolution. By the early 1800s, Indian removal was a significant issue throughout the southeastern U.S. and also in Florida. In 1830, the U.S. Congress passed the Indian Removal Act and as settlement increased, pressure grew on the U.S. government to remove the Indians from Florida. 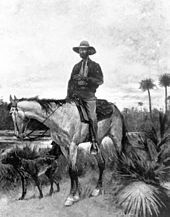 Seminoles offered sanctuary to blacks, and these became known as the Black Seminoles, and clashes between whites and Indians grew with the influx of new settlers. In 1832, the Treaty of Payne's Landing promised to the Seminoles lands west of the Mississippi River if they agreed to leave Florida. Many Seminole left at this time. On March 3, 1845, only one day before the end of President John Tyler's term in office, Florida became the 27th state to join the United States of America. The state was admitted as a slave state and ceased to be a sanctuary for runaway slaves. Initially its population grew slowly. The Confederacy received little help from Florida; the 15,000 men it offered were generally sent elsewhere. Instead of men and manufactured goods, Florida did provide salt and, more importantly, beef to feed the Confederate armies. This was particularly important after 1864, when the Confederacy lost control of the Mississippi River, thereby losing access to Texas beef. The largest engagements in the state were the Battle of Olustee, on February 20, 1864, and the Battle of Natural Bridge, on March 6, 1865. Both were Confederate victories. The war ended in 1865. In 1939, Florida was described as "still very largely an empty State." Subsequently, the growing availability of air conditioning, the climate, and a low cost of living made the state a haven. Migration from the Rust Belt and the Northeast sharply increased Florida's population after 1945. In the 1960s, many refugees from Cuba fleeing Fidel Castro's communist regime arrived in Miami at the Freedom Tower, where the federal government used the facility to process, document and provide medical and dental services for the newcomers. As a result, the Freedom Tower was also called the "Ellis Island of the South." In recent decades, more migrants have come for the jobs in a developing economy. 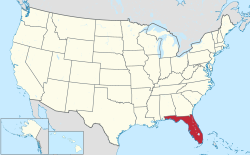 Much of Florida is on a peninsula between the Gulf of Mexico, the Atlantic Ocean and the Straits of Florida. Spanning two time zones, it extends to the northwest into a panhandle, extending along the northern Gulf of Mexico. It is bordered on the north by Georgia and Alabama, and on the west, at the end of the panhandle, by Alabama. It is the only state that borders the Atlantic Ocean and the Gulf of Mexico. Florida also is the southernmost state in the 48 contiguous states, with Hawaii being the only state reaching farther south. Florida is west of The Bahamas and 90 miles (140 km) north of Cuba. Florida is one of the largest states east of the Mississippi River, and only Alaska and Michigan are larger in water area. The water boundary is 3 nautical miles (3.5 mi; 5.6 km) offshore in the Atlantic Ocean and 9 nautical miles (10 mi; 17 km) offshore in the Gulf of Mexico. The state tree, Sabal palmetto, flourishes in Florida's overall warm climate. Due to its subtropical and tropical climate, Florida rarely receives measurable snowfall. However, on rare occasions, a combination of cold moisture and freezing temperatures can result in snowfall in the farthest northern regions like Jacksonville, Gainesville or Pensacola. Frost, which is more common than snow, sometimes occurs in the panhandle. The USDA Plant hardiness zones for the state range from zone 8a (no colder than 10 °F or −12 °C) in the inland western panhandle to zone 11b (no colder than 45 °F or 7 °C) in the lower Florida Keys. Fog also occurs all over the state or climate of Florida. Hurricanes pose a severe threat each year during June 1 to November 30 hurricane season, particularly from August to October. Florida is the most hurricane-prone state, with subtropical or tropical water on a lengthy coastline. Of the category 4 or higher storms that have struck the United States, 83% have either hit Florida or Texas. Reptiles: eastern diamondback and pygmy rattlesnakes, gopher tortoise, green and leatherback sea turtles, and eastern indigo snake. In 2012, there were about one million American alligators and 1,500 crocodiles. Birds: peregrine falcon, bald eagle, American flamingo, northern caracara, snail kite, osprey, white and brown pelicans, sea gulls, whooping and sandhill cranes, roseate spoonbill, American white ibis, Florida scrub jay (state endemic), and others. One subspecies of wild turkey, Meleagris gallopavo, namely subspecies osceola, is found only in Florida. The state is a wintering location for many species of eastern North American birds. Florida also has more than 500 nonnative animal species and 1,000 nonnative insects found throughout the state. 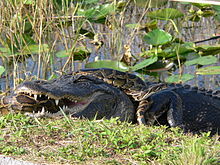 Some exotic species living in Florida include the Burmese python, green iguana, veiled chameleon, Argentine black and white tegu, peacock bass, mayan cichlid, lionfish, White-nosed coati, rhesus macaque, vervet monkey, Cuban tree frog, cane toad, Indian peafowl, monk parakeet, tui parakeet, and many more. Some of these nonnative species do not pose a threat to any native species, but some do threaten the native species of Florida by living in the state and eating them. Red mangroves in Everglades National Park. There are about 3,000 different types of wildflowers in Florida. This is the third-most diverse state in the union, behind California and Texas, both larger states. In Florida, wild populations of coconut palms extend up the East Coast from Key West to Jupiter Inlet, and up the West Coast from Marco Island to Sarasota. Many of the smallest coral islands in the Florida Keys are known to have abundant coconut palms sprouting from coconuts that have drifted or been deposited by ocean currents. Coconut palms are cultivated north of south Florida to roughly Cocoa Beach on the East Coast and the Tampa Bay Area on the West Coast. On the east coast of the state, mangroves have normally dominated the coast from Cocoa Beach southward; salt marshes from St. Augustine northward. From St. Augustine south to Cocoa Beach, the coast fluctuates between the two, depending on the annual weather conditions. All three mangrove species flower in the spring and early summer. Propagules fall from late summer through early autumn. 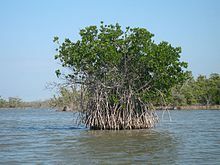 Florida mangrove plant communities covered an estimated 430,000 to 540,000 acres (1,700 to 2,200 km2) in Florida in 1981. Ninety percent of the Florida mangroves are in southern Florida, in Collier, Lee, Miami-Dade and Monroe Counties. The Florida Reef is the only living coral barrier reef in the continental United States. It is also the third largest coral barrier reef system in the world, after the Great Barrier Reef and the Belize Barrier Reef. The reef lies a little bit off of the coast of the Florida Keys. A lot of the reef lies within John Pennekamp Coral Reef State Park, which was the first underwater park in the United States. The park contains a lot of tropical vegetation, marine life, and seabirds. The Florida Reef extends into other parks and sanctuaries as well including Dry Tortugas National Park, Biscayne National Park, and the Florida Keys National Marine Sanctuary. Almost 1,400 species of marine plants and animals, including more than 40 species of stony corals and 500 species of fish, live on the Florida Reef. The Florida Reef, being a delicate ecosystem like other coral reefs, faces many threats including overfishing, plastics in the ocean, coral bleaching, rising sea levels, and changes in sea surface temperature. Florida is a low per capita energy user. It is estimated that approximately 4% of energy in the state is generated through renewable resources. Florida's energy production is 6% of the nation's total energy output, while total production of pollutants is lower, with figures of 6% for nitrogen oxide, 5% for carbon dioxide, and 4% for sulfur dioxide. Wildfires in Florida occur at all times of the year. Red tide has been an issue on the southwest coast of Florida, as well as other areas. While there has been a great deal of conjecture over the cause of the toxic algae bloom, there is no evidence that it is being caused by pollution or that there has been an increase in the duration or frequency of red tides. Red tide is now killing off wildlife or Tropical fish and coral reefs putting all in danger. The Florida panther is close to extinction. A record 23 were killed in 2009, mainly by automobile collisions, leaving about 100 individuals in the wild. The Center for Biological Diversity and others have therefore called for a special protected area for the panther to be established. Manatees are also dying at a rate higher than their reproduction. American flamingos are rare to see in Florida due to being hunted in the 1900s, where it was to a point considered completely extirpated. Now the flamingos are reproducing toward making a comeback to South Florida since it is adamantly considered native to the state and also are now being protected. Much of Florida has an elevation of less than 12 feet (3.7 m), including many populated areas. Therefore, it is susceptible to rising sea levels associated with global warming. The Atlantic beaches that are vital to the state's economy are being washed out to sea due to rising sea levels caused by climate change. The Miami beach area, close to the continental shelf, is running out of accessible offshore sand reserves. Elevated temperatures can damage coral reefs, causing coral bleaching. The first recorded bleaching incident on the Florida Reef was in 1973. Incidents of bleaching have become more frequent in recent decades, in correlation with a rise in sea surface temperatures. White band disease has also adversely affected corals on the Florida Reef. The Florida Keys seen from a satellite – many of the Keys are made of limestone. The Florida peninsula is a porous plateau of karst limestone sitting atop bedrock known as the Florida Platform. The largest deposits of potash in the United States are found in Florida. The largest deposits of rock phosphate in the country are found in Florida. Most of this is in Bone Valley. Extended systems of underwater caves, sinkholes and springs are found throughout the state and supply most of the water used by residents. The limestone is topped with sandy soils deposited as ancient beaches over millions of years as global sea levels rose and fell. During the last glacial period, lower sea levels and a drier climate revealed a much wider peninsula, largely savanna. While there are sinkholes in much of the state, modern sinkholes have tended to be in West-Central Florida. Everglades National Park covers 1,509,000 acres (6,110 km2), throughout Dade, Monroe, and Collier counties in Florida. The Everglades, an enormously wide, slow-flowing river encompasses the southern tip of the peninsula. Sinkhole damage claims on property in the state exceeded a total of $2 billion from 2006 through 2010. Winter Park Sinkhole, in central Florida, appeared May 8, 1981. It was approximately 350 feet (107 m) wide and 75 feet (23 m) deep. It was notable as one of the largest recent sinkholes to form in the United States. It is now known as Lake Rose. The Econlockhatchee River (Econ River for short) is an 87.7-kilometer-long (54.5 mi) north-flowing blackwater tributary of the St. Johns River, the longest river in the U.S. state of Florida. The Econ River flows through Osceola, Orange, and Seminole counties in Central Florida, just east of the Orlando Metropolitan Area (east of State Road 417). It is a designated Outstanding Florida Waters. Earthquakes are rare because Florida is not located near any tectonic plate boundaries. The United States Census Bureau estimates that the population of Florida was 21,299,325 on July 1, 2018, a 13.29% increase since the 2010 United States Census. The population of Florida in the 2010 census was 18,801,310. Florida was the seventh fastest-growing state in the U.S. in the 12-month period ending July 1, 2012. In 2010, the center of population of Florida was located between Fort Meade and Frostproof. The center of population has moved less than 5 miles (8 km) to the east and approximately 1 mile (1.6 km) to the north between 1980 and 2010 and has been located in Polk County since the 1960 census. The population exceeded 19.7 million by December 2014, surpassing the population of the state of New York for the first time. The Florida population was 21,299,325 residents or people according to the U.S. Census Bureau's 2018 Population Estimates Program. Hispanic and Latinos of any race made up 22.5% of the population in 2010. As of 2011[update], 57% of Florida's population younger than age 1 were minorities (meaning that they had at least one parent who was not non-Hispanic white). As of 2010[update], those of (non-Hispanic white) European ancestry accounted for 57.9% of Florida's population. Out of the 57.9%, the largest groups were 12.0% German (2,212,391), 10.7% Irish (1,979,058), 8.8% English (1,629,832), 6.6% Italian (1,215,242), 2.8% Polish (511,229), and 2.7% French (504,641). White Americans of all European backgrounds are present in all areas of the state. In 1970, non-Hispanic whites were nearly 80% of Florida's population. Those of English and Irish ancestry are present in large numbers in all the urban/suburban areas across the state. Some native white Floridians, especially those who have descended from long-time Florida families, may refer to themselves as "Florida crackers"; others see the term as a derogatory one. Like whites in most other states of the southern U.S., they descend mainly from English and Scots-Irish settlers, as well as some other British American settlers. Cuban men playing dominoes in Miami's Little Havana. In 2010, Cubans made up 34.4% of Miami's population and 6.5% of Florida's. As of 2010[update], those of African ancestry accounted for 16.0% of Florida's population, which includes African Americans. Out of the 16.0%, 4.0% (741,879) were West Indian or Afro-Caribbean American. During the early 1900s, black people made up nearly half of the state's population. In response to segregation, disfranchisement and agricultural depression, many African Americans migrated from Florida to northern cities in the Great Migration, in waves from 1910 to 1940, and again starting in the later 1940s. They moved for jobs, better education for their children and the chance to vote and participate in society. By 1960, the proportion of African Americans in the state had declined to 18%. Conversely, large numbers of northern whites moved to the state. Today, large concentrations of black residents can be found in northern and central Florida. Aside from blacks descended from African slaves brought to the southern U.S., there are also large numbers of blacks of West Indian, recent African, and Afro-Latino immigrant origins, especially in the Miami/South Florida area. As of 2010[update], those of Asian ancestry accounted for 2.4% of Florida's population. 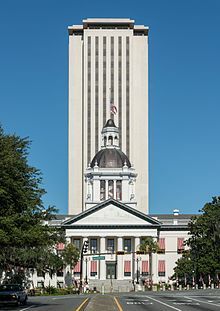 The Florida Legislature comprises the Florida Senate, which has 40 members, and the Florida House of Representatives, which has 120 members. The current Governor of Florida is Ron DeSantis. 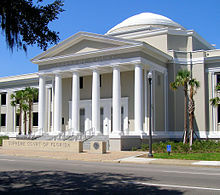 The Florida Supreme Court consists of a Chief Justice and six Justices. Capital punishment is applied in Florida. In 1995, the legislature modified Chapter 921 to provide that felons should serve at least 85% of their sentence. Florida approved its lottery by amending the constitution in 1984. It approved slot machines in Broward and Miami-Dade County in 2004. It has disapproved casinos (outside of sovereign Seminole and Miccosukee tribal areas) three times: 1978, 1986, and 1994. If a person committing a predicate felony directly contributed to the death of the victim then the person will be charged with murder in the first degree – felony murder which is a capital felony. The only two sentences available for that statute are life in prison and the death penalty. If a person commits a predicate felony, but was not the direct contributor to the death of the victim then the person will be charged with murder in the second degree – felony murder which is a felony of the first degree. The maximum prison term is life. The Brickell Financial District in Miami contains the largest concentration of international banks in the United States. Florida's economy ranks among the largest in the world. As of Q2 2018, the gross state product (GSP) is about $1.0 trillion, the fourth largest economy in the United States. Florida is responsible for 5.0 percent of the United States' approximate $20.4 trillion gross domestic product (GDP). As of 2018[update], Florida's nominal GDP is larger than all but 16 countries. In terms of Purchasing Power Parity, it is larger than all but 24 countries. In the twentieth century, tourism, industry, construction, international banking, biomedical and life sciences, healthcare research, simulation training, aerospace and defense, and commercial space travel have contributed to the state's economic development. The five largest sectors of employment in Florida are: trade, transportation, and utilities; government; professional and business services; education and health services; and leisure and hospitality. In output, the five largest sectors are: finance, insurance, real estate, rental, and leasing, followed by professional and business services; government and government enterprises; educational services, health care, and social assistance; and retail trade. In 2017, Florida became the United States' eighth largest exporter of trade goods. Florida's top countries for export are Brazil, Canada, Mexico, Germany, and Colombia. In 2017, Florida became the United States' tenth largest importer of trade goods. Florida imported US$75.4 billion worth of goods from around the globe in 2017. The value of Florida's imports equals 3.2% of United States' overall imported products for 2017. Florida's top countries for imports are China, Mexico, Canada, Germany, and France. The Miami Metropolitan Area has the highest GDP of all the metro areas in Florida with $344.9 billion in 2017. This is more than twice the number of the next metro area, the Tampa Bay Area, which has a GDP of $145.3 billion. The economy of Florida is driven almost entirely by its nineteen metropolitan areas. In 2004, they had a combined total of 95.7% of the state's domestic product. Per capita GDP in 2017 was $39,842, ranking fortieth in the nation. Per capita income varies widely by geographic region and profession. North Florida and the rural counties of the Florida Panhandle are the most impoverished in the state. Florida has a poverty rate of 14.0%, the seventeenth lowest of any state in the country. Many coastal cities include some of the wealthiest per-capita areas in the United States. In 2018, there were more than 427,824 millionaires in the state, the fourth highest number in the nation. For 2018–19, the approved state budget is $88.7 billion, a 4.4% increase over the previous 2017–18 budget of $84.9 billion. Chief Executive Magazine named Florida the third "Best State for Business" in 2011. In 2017, Florida's per capita personal income was $47,684, ranking 26th in the nation. The state's unemployment rate in September 2018 was 3.5% and ranked as the 18th lowest in the United States. Florida is one of seven states that do not impose a personal income tax. In 2017, Florida had a personal income of $1,000,624,065(in thousands of dollars). This personal income ranked 4th in the United States. Florida's constitution establishes a state minimum wage that is adjusted for inflation annually. As of January 1, 2017[update], Florida's minimum wage was $5.08 for tipped positions, and $8.10 for non-tipped positions, which was higher than the federal rate of $7.25. Florida has 2 cities in the top 25 cities in the U.S. with the highest average credit card debt, Miami and Tampa. The poverty rate in Florida is 14% in 2018. This is down from a peak of 17.1% in 2012. PortMiami is the world's largest cruise ship port. Tourism makes up one of the largest sectors of the state economy, with nearly 1.4 million people employed in the tourism industry in 2016 (a record for the state, surpassing the 1.2 million employment from 2015). In 2015, Florida broke the 100-million visitor mark for the first time in state history by hosting a record 105 million visitors. The state has set tourism records for eight consecutive years, most recently breaking the 120-million visitor mark for the first time in 2018 with 126.1 million visitors reported. Amusement parks, especially in the Greater Orlando area, make up a significant portion of tourism. The Walt Disney World Resort is the most visited vacation resort in the world with over 50 million annual visitors, consisting of four theme parks, 27 themed resort hotels, 9 non–Disney hotels, two water parks, four golf courses and other recreational venues. Other major theme parks in the area include Universal Orlando Resort, SeaWorld Orlando and Busch Gardens Tampa. Today, Walt Disney World is the most visited vacation resort in the world, with an average annual attendance of over 52 million. Florida's many state parks and protected areas receive a lot of visitors as well with 25.2 million visitors visiting Florida State Parks in 2013. Citrus canker continues to be an issue of concern. From 1997 to 2013, the growing of citrus trees has declined 25%, from 600,000 acres (240,000 ha) to 450,000 acres (180,000 ha). Citrus greening disease is incurable. A study states that it has caused the loss of $4.5 billion between 2006 and 2012. As of 2014[update], it was the major agricultural concern. The state has a near monopoly on saw palmetto berries, an alternative medicine used to treat prostate and urinary disorders. Port Tampa Bay is the largest port in Florida. Florida has many seaports that serve container ships, tank ships, and cruise lines. Major ports in Florida include Port Tampa Bay in Tampa, Port Everglades in Fort Lauderdale, Port of Jacksonville in Jacksonville, PortMiami in Miami, Port Canaveral in Brevard County, Port Manatee in Manatee County, and Port of Palm Beach in Riviera Beach. The world's top three busiest cruise ports are found in Florida with PortMiami as the busiest and Port Canaveral and Port Everglades as the second and third busiest. Port Tampa Bay meanwhile is the largest in the state, having the most tonnage. As of 2013[update], Port Tampa Bay ranks 16th in the United States by tonnage in domestic trade, 32nd in foreign trade, and 22nd in total trade. It is the largest, most diversified port in Florida, has an economic impact of more than $15.1 billion, and supports over 80,000 jobs. Florida overall was ranked the 7th best state in America for educating students at all levels by U.S. News & World Report in 2018. With an educational system made up of public school districts and independent private institutions, Florida had 2,833,115 students enrolled in 4,269 public primary, secondary, and vocational schools in Florida's 67 regular or 7 special school districts as of 2018[update]. Miami-Dade County is the largest of Florida's 67 regular districts with over 350 thousand students and Jefferson is the smallest with less than one thousand students. Florida spent $8,920 for each student in 2016, and was 43rd in the nation in expenditures per student. The State University System of Florida was founded in 1905, and is governed by the Florida Board of Governors. During the 2010 academic year, 312,216 students attended one of these twelve universities. The Florida College System comprises 28 public community and state colleges. In 2011–12, enrollment consisted of more than 875,000 students. As of 2017[update], the University of Central Florida, with over 64,000 students, is the largest university by enrollment in the United States. Florida's first private university, Stetson University, was founded in 1883. The Independent Colleges and Universities of Florida is an association of 28 private, educational institutions in the state. This Association reported that their member institutions served over 121,000 students in the fall of 2006. 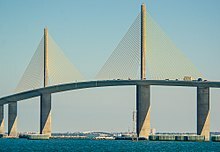 The Sunshine Skyway Bridge over Tampa Bay is a part of Florida's interstate system. Florida's highway system contains 1,495 mi (2,406 km) of interstate highway, and 10,601 mi (17,061 km) of non-interstate highway, such as state highways and U.S. Highways. Florida's interstates, state highways, and U.S. Highways are maintained by the Florida Department of Transportation. Intercity bus travel, which utilizes Florida's highway system, is provided by Greyhound, Megabus, and Amtrak Thruway Motorcoach. I-95, which spans 382 miles in Florida, enters the state near Jacksonville and continues along the Atlantic Coast through Daytona Beach, the Melbourne/Titusville, Palm Bay, Vero Beach, Fort Pierce, Port Saint Lucie, Stuart, West Palm Beach, and Fort Lauderdale, before terminating in Downtown Miami. It has interchanges with I-10 in Jacksonville and I-4 in Daytona Beach, and there are four auxiliary routes associated with the interstate. It is the longest north-south interstate with a total length of 1924 miles and terminates at the Canadian border northeast of Houlton, Maine. 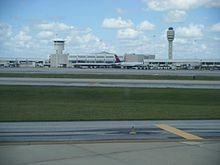 Orlando International Airport is the busiest airport in the state with 44.6 million total passengers traveled in 2017. Virgin Trains USA is a diesel–electric higher-speed rail system. Currently service is only from Fort Lauderdale to West Palm Beach. 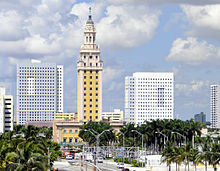 The first phase is planned to connect Miami to West Palm Beach through express intercity service, with a stop at Fort Lauderdale. The complete project is intended to connect Miami and South Florida to Orlando, which requires a new line westward from the coast. 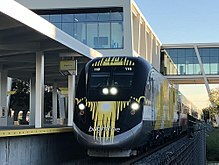 It partially opened for passenger service between Fort Lauderdale and West Palm Beach on January 13, 2018, as the only privately owned and operated passenger railroad in the United States. With a top speed of 125 mph (201 km/h), Brightline will eventually be tied with Amtrak's Northeast Regional and the MARC's Penn Line commuter rail as the second fastest passenger train in North America, after Amtrak's Acela Express. Florida is also served by Amtrak, operating numerous lines throughout, connecting the state's largest cities to points north in the United States and Canada. The busiest Amtrak train stations in Florida in 2011 were: Sanford (259,944), Orlando (179,142), Tampa Union Station (140,785), Miami (94,556), and Jacksonville (74,733). Sanford, in Greater Orlando, is the southern terminus of the Auto Train, which originates at Lorton, Virginia, south of Washington, D.C. Until 2005, Orlando was also the eastern terminus of the Sunset Limited, which travels across the southern United States via New Orleans, Houston, and San Antonio to its western terminus of Los Angeles. Florida is served by two additional Amtrak trains (the Silver Star and the Silver Meteor), which operate between New York City and Miami. Virgin MiamiCentral in Greater Downtown Miami and the Miami Intermodal Center near Miami International Airport are major hubs for rapid transit, commuter rail, intercity rail, and buses. The Miami Metrorail is the state's only rapid transit system. About 15% of Miamians use public transit daily. Daytona International Speedway is home to various auto racing events. NASCAR (headquartered in Daytona Beach) begins all three of its major auto racing series in Florida at Daytona International Speedway in February, featuring the Daytona 500, and ends all three Series in November at Homestead-Miami Speedway. Daytona also has the Coke Zero Sugar 400 NASCAR race weekend around Independence Day in July. The 24 Hours of Daytona is one of the world's most prestigious endurance auto races. The Grand Prix of St. Petersburg and Grand Prix of Miami have held IndyCar races as well. Florida is a major golf hub. The PGA of America is headquartered in Palm Beach Gardens, the PGA Tour is headquartered in Ponte Vedra Beach, and the LPGA is headquartered in Daytona Beach. The Players Championship, WGC-Cadillac Championship, Arnold Palmer Invitational, Honda Classic and Valspar Championship are PGA Tour rounds. Florida has teams in all of the major league sports – National Football League, Major League Baseball, National Basketball Association, National Hockey League, and Major League Socce Florida's most recent major-league team, Orlando City, began play in MLS in 2015. Minor league baseball, football, basketball, ice hockey, soccer and indoor football teams are based in Florida. Three of the Arena Football League's teams are in Florida. Ben Hill Griffin Stadium is the largest football stadium in Florida, the 12th largest stadium in American college football, and the 18th largest stadium in the world, as measured by its official seating capacity of 88,548 – though, it has often held over 90,000 for Florida's home football games. Florida's universities have a number of collegiate sport programs. Major college football programs include the Florida State Seminoles and Miami Hurricanes of the Atlantic Coast Conference, and the Florida Gators of the Southeastern Conference. Since 1996, Florida has added four additional programs to the ranks of Division I FCS: UCF Knights, South Florida Bulls, Florida Atlantic Owls and FIU Panthers. Florida Panther is the state animal. Coconut palms like these in Islamorada flourish in the Florida Keys. 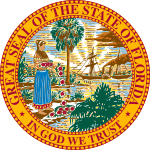 The majority of the symbols were chosen after 1950; only the two oldest symbols—the state flower (chosen in 1909), and the state bird (chosen in 1927), and the state nickname (chosen in 1970)—are not listed in the 2010 Florida Statutes. Anthem: "Florida (Where the Sawgrass Meets the Sky)"
Festival: "Calle Ocho-Open House 8"
Motto: "In God We Trust"
Song: "Old Folks at Home"
^ "State Motto". Florida Department of State. Retrieved September 14, 2018. ^ "Article 2, Section 9, Constitution of the State of Florida". State of Florida. 1988. Retrieved September 14, 2018. ^ "Florida". Modern Language Association. Retrieved June 29, 2014. ^ "United States Summary: 2010. Population and Housing Unit Counts. 2010 Census of Population and Housing" (PDF). United States Census Bureau. September 2012. p. 41. Retrieved April 9, 2019. ^ "Population and Housing Unit Estimates". United States Census Bureau. January 4, 2019. Retrieved January 4, 2019. ^ a b "SB 230 – State Symbols/Fla. Cracker Horse/Loggerhead Turtle [RPCC]". Florida House of Representatives. Retrieved April 7, 2012. ^ "Florida Passes New York to Become Nation's Third Most Populous State" (Press release). United States Census Bureau. December 23, 2014. Retrieved December 23, 2014. ^ "Gross Domestic Product by State: Second Quarter 2018" (PDF). Bea.gov. Retrieved October 23, 2018. ^ "World Population Prospects – Population Division – United Nations". esa.un.org. Retrieved October 22, 2018. ^ a b c Analysis, US Department of Commerce, BEA, Bureau of Economic. "Bureau of Economic Analysis". apps.bea.gov. ^ a b "Unemployment Rates for States". Bls.gov. ^ "Why Florida : Boundless Reasons" (PDF). Enterpriseflorida.com. Retrieved October 23, 2018. ^ a b "Gross Domestic Product by Metropolitan Area, 2017" (PDF). Bea.gov. Retrieved October 23, 2018. ^ Pounds, Marcia Heroux. "Florida home to 51 of world's billionaires, Forbes says – Video". Sun-sentinel.com. ^ a b Megan Garber. "Science: Several U.S. States, Led by Florida, Are Flatter Than a Pancake". The Atlantic. ^ "Welcome to the Lake Okeechobee". ^ "The Ultimate Guide to Florida's East Coast Beaches". Visitflorida.com. ^ "The Top Ten: States with Longest Coastlines". InfoPlease. ^ a b Bernie McGovern, Florida Almanac (2007–08 ed.). ^ "Florida Islands – The Florida Keys". Floridakeys-guide.com. ^ "Köppen Climate Classification Map". John Abbott College, Geosciences Department. Archived from the original on November 20, 2010. Retrieved July 18, 2007. ^ "NOAA CoRIS – Regional Portal – Florida". Coris.noaa.gov. ^ The biggest coral reef in the continental U.S. is dissolving into the ocean. Retrieved May 6, 2016. ^ Administration, US Department of Commerce, National Oceanic and Atmospheric. "NOAA CoRIS – Regional Portal – Florida". coris.noaa.gov. Retrieved October 23, 2018. ^ From the 1601 publication by the pre-eminent historian of 16th-century Spanish exploration in America, Antonio de Herrera y Tordesillas, in Stewart, George (1945). Names on the Land: A Historical Account of Place-Naming in the United States. New York: Random House. pp. 11–12. ISBN 978-1-59017-273-5. ^ "Michael Francis: La historia entre Florida y España es de las más ricas de Estados Unidos". Retrieved July 18, 2016. ^ Davidson, James West. After the Fact: The Art of Historical Detection Volume 1. Mc Graw Hill, New York 2010, Chapter 1, p. 7. ^ Pope, Sarah Dillard. "Aboard the Underground Railroad—Fort Mose Site". Nps.gov. ^ "Fort Mose Historical Society". Retrieved July 18, 2016. ^ Florida Center for Instructional Technology. "Floripedia: Florida: As a British Colony". Fcit.usf.edu. Retrieved October 2, 2009. ^ Wood, Wayne (1992). Jacksonville's Architectural Heritage. University Press of Florida. p. 22. ISBN 978-0-8130-0953-7. ^ Beach, William Wallace (1877). The Indian Miscellany. J. Munsel. p. 125. ^ Wells, Judy (March 2, 2000). "City had humble beginnings on the banks of the St. Johns". The Florida Times-Union. Retrieved July 2, 2011. ^ "Transfer of Florida". fcit.usf.edu. ^ "Florida's Early Constitutions – Florida Memory". Retrieved July 16, 2017. ^ "A Century of Lawmaking for a New Nation: U.S. Congressional Documents and Debates, 1774–1875". loc.gov. Retrieved July 21, 2015. ^ "Andrew Jackson". Florida Department of State. Retrieved July 18, 2016. ^ "Florida Seceded! January 10, 1861|America's Story from America's Library". America's Library. Retrieved November 14, 2017. ^ Taylor, Paul. (2012) Discovering the Civil War in Florida: A Reader and Guide (2nd edition). pp. 3–4, 59, 127. Sarasota, Fl. : Pineapple Press. ^ Nancy A. Hewitt (2001). Southern Discomfort: Women's Activism in Tampa, Florida, 1880s–1920s. University of Illinois Press. p. 22. ISBN 978-0-252-02682-9. ^ Historical Census Browser, 1900 Federal Census, University of Virginia [dead link]. Retrieved March 15, 2008. ^ Rogers, Maxine D.; Rivers, Larry E.; Colburn, David R.; Dye, R. Tom & Rogers, William W. (December 1993), "Documented History of the Incident Which Occurred at Rosewood, Florida in January 1923" Archived May 15, 2008, at the Wayback Machine, p. 5. Retrieved April 9, 2011. ^ Federal Writers' Project (1939). Florida. A Guide to the Southernmost State. New York: Oxford University Press. p. 7. ^ "Freedom Tower—American Latino Heritage: A Discover Our Shared Heritage Travel Itinerary". Nps.gov. ^ Munzenrieder, Kyle (December 23, 2014). "Florida Is Now Officially the Third Most Populous State". Miaminewtimes.com. ^ "A Great Migration From Puerto Rico Is Set to Transform Orlando". The New York Times. November 17, 2017. ^ a b Office of Ocean and Coastal Resource Management (July 1, 2011). "State Coastal Zone Boundaries" (PDF). National Oceanic and Atmospheric Administration. Retrieved October 28, 2011. ^ Main, Martin B.; Allen, Ginger M. (July 2007). "The Florida Environment: An Overview". University of Florida, Institute of Food and Agricultural Sciences. Archived from the original on November 20, 2010. Retrieved January 23, 2008. ^ "Green Mountain Scenic Byway". Florida Department of Transportation. Archived from the original on March 6, 2008. Retrieved January 23, 2008. ^ Ritter, Michael. "Wet/Dry Tropical Climate". University of Wisconsin, Stevens Point. Archived from the original on November 20, 2010. Retrieved July 18, 2007. ^ "Average Annual Temperature for Each US State". Current Results Nexus. Retrieved August 19, 2011. ^ "Hottest States in the US – Current Results". Currentresults.com. ^ "Cold Weather Hazards". National Weather Service Miami, Florida. Retrieved June 19, 2018. ^ "Hazardous Weather: A Florida Guide – Temperatures". FloridaDisaster.org. Retrieved October 9, 2016. ^ "Temperature Extremes". Mymanatee.org. June 11, 2012. Retrieved October 9, 2016. ^ "Has It Ever Snowed in Florida?". Worldatlas.com. ^ Geggis, Anne. "Brrrrr! South Florida may see frost by week's end". Sun-sentinel.com. ^ United States National Arboretum. "Florida Hardiness Zones". St Johns River Water Management District. Retrieved March 25, 2011. ^ "Dense Fog Advisory". miami.cbslocal.com. ^ "NowData – NOAA Online Weather Data". National Oceanic and Atmospheric Administration. Retrieved March 5, 2012. ^ "PENSACOLA FAA ARPT, FLORIDA—Climate Summary". Southeast Regional Climate Center. Archived from the original on January 18, 2008. Retrieved January 26, 2008. ^ "Lightning Information Center". National Weather Service. Archived from the original on November 20, 2010. Retrieved January 23, 2008. ^ "Total Precipitation in inches by month". NOAA. Retrieved March 31, 2013. ^ "Thunderstorms – Florida Climate Center". climatecenter.fsu.edu. ^ Aten, Tim (July 1, 2007). "Waterspouts common off coastal Florida in summer". Naples Daily News. Archived from the original on December 5, 2010. Retrieved January 23, 2008. ^ a b "Florida is US lightning capital". Florida Today Factbook. March 28, 2009. p. 34. ^ "How Often Hurricanes Make Landfall in Florida". Tripsavvy.com. ^ "The 25th Anniversary of Hurricane Andrew". Aoml.noaa.gov. ^ "Leatherback Nesting in Florida". myfwc.com. ^ Morgan, Curtis (April 9, 2012). "Crocs crawl back to coast". Florida Today. Melbourne, Florida. pp. 8B. Archived from the original on April 10, 2012. ^ Winston, Keith (December 24, 2013). "Predator animals rebound". Florida Today. Melbourne, Florida. pp. 7B. Retrieved December 29, 2013. ^ "Surprising Origin of American Flamingos Discovered". News.mationalgeographic.com. March 10, 2018. ^ a b Winsten, Keith (January 7, 2014). "'Snow' bird species in South". Florida Today. Melbourne, Florida. pp. 7B. Retrieved January 7, 2014. ^ "BIOLOGICAL CONTROL OF INVASIVE INSECT PESTS OF CROPS AND NATIVE FLORA IN FLORIDA". Usda.gov/. ^ "Native Plants – University of Florida, Institute of Food and Agricultural Sciences". gardeningsolutions.ifas.ufl.edu. ^ Sonnenberg, Maria (September 21, 2013). "Florida's flowers". Florida Today. Melbourne, Florida. p. 1D. Retrieved September 21, 2013. ^ Crane, Timothy K. Broschat and Jonathan H. (April 4, 2018). "The Coconut Palm in Florida". edis.ifas.ufl.edu. ^ "Energy Consumption by Source and Total Consumption per Capita, Ranked by State, 2004" (PDF). U.S. Department of Energy. Archived (PDF) from the original on February 22, 2010. Retrieved January 27, 2008. ^ a b "State Energy Profiles: Florida". U.S. Department of Energy. Archived from the original on January 7, 2008. Retrieved January 27, 2008. ^ "Current Wildfire Conditions / Wildland Fire / Florida Forest Service / Divisions & Offices / Home – Florida Department of Agriculture & Consumer Services". Freshfromflorida.com. Retrieved October 23, 2018. ^ "Florida Statutes". Leg.state.fl.us. Retrieved November 4, 2011. ^ Daley, Beth (March 28, 2005). "Tide's toxins trouble lungs ashore". Boston Globe. Archived from the original on November 20, 2010. Retrieved December 3, 2007. ^ "Why Florida's red tide is killing fish, manatees, and turtles". Vox.com. ^ Williams Hale, Leslie (December 29, 2009). "Record number of panthers killed by vehicles in 2009". Naples News. Archived from the original on November 20, 2010. Retrieved January 1, 2010. ^ "More manatees have died in Florida so far this year than in all of 2017. Here's why". Miamiherald.com. ^ "Florida's Long-Lost Wild Flamingos Were Hiding in Plain Sight". Npr.org. 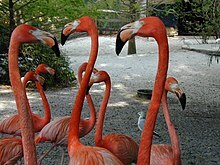 ^ "Now that we agree these flamingos are Florida natives, it's time to protect them, experts say". Miamiherald.com. ^ Jeff Goodell (June 20, 2013). "Goodbye, Miami". Rolling Stone. Retrieved June 21, 2013. ^ "Where Sand Is Gold, the Reserves Are Running Dry". The New York Times. August 25, 2013. ^ Wilkinson, Jerry. "History of Keys Geology". Keyshistory.org. ^ a b "Industry overview". First research. Hoover's. March 25, 2010. Archived from the original on February 14, 2010. ^ Parsons, Victoria (Spring 2011). "The Real Cost of Fertilizer". Bay Soundings. Retrieved June 21, 2014. ^ Allen, Ginger M.; Main, Martin B (May 2005). "Florida's Geological History". Florida Cooperative Extension Service. University of Florida. Archived from the original on November 20, 2010. Retrieved January 20, 2009. ^ Tihansky, Ann B. "Sinkholes, West-Central Florida. A link between surface water and ground water" (PDF). U.S. Geological Survey, Tampa, Florida. Retrieved June 21, 2014. ^ "Sinkhole Maps of Florida Counties". Florida Center for Instructional Technology, College of Education. University of South Florida. 2007. Retrieved June 21, 2014. ^ "State Farm seeks 28% rate hike". Florida Today. Melbourne, Florida. February 16, 2011. p. 8B. Archived from the original on February 19, 2011. ^ Huber, Red (November 13, 2012). "Looking back at Winter Park's famous sinkhole". Orlando Sentinel. ^ (2013-01-02). "Econlockhatchee River". Saint Johns River Water Management District. Retrieved on August 4, 2014. ^ "Florida's Earthquake History and Tectonic Setting". Decodedscience.org. January 23, 2015. ^ Resident Population Data. "Resident Population Data – 2010 Census". 2010.census.gov. Archived from the original on July 21, 2011. Retrieved November 4, 2011. ^ Website Services & Coordination Staff (WSCS). "2010 Census Interactive Population Search". census.gov. Retrieved July 21, 2015. ^ Weissmann, Jordan (December 22, 2012). "The Fastest-Growing States in America (and Why They're Booming)". The Atlantic. Retrieved August 14, 2014. ^ "Florida's Population Center Migrates through History". University of Florida Bureau of Economic and Business Research. Archived from the original on August 14, 2013. Retrieved August 14, 2014. ^ "Florida Leaves New York Behind in Its Rear-View Mirror – National Review". Nationalreview.com. December 23, 2014. Retrieved October 23, 2018. ^ Pramuk, Jacob (December 23, 2014). "Move over, NY: This state now 3rd most populous". Cnbc.com. ^ Michael B. Sauter; Douglas A. McIntyre (May 10, 2011). "The States with the Oldest And Youngest Residents". wallst.com. ^ "Retired Military Personnel". The Intercom. Patrick Air Force Base, Florida: Military Officers Association of Cape Canaveral. June 2009. p. 4. ^ Amy Goodman (April 6, 2009). ""A Ponzi State"–Univ. of South Florida Professor Examines the Economic Crisis in Florida". Democracy Now!. ^ Slevin, Peter (April 30, 2010). "New Arizona law puts police in 'tenuous' spot". Washington Post. Washington, D.C. p. A4. Archived from the original on November 10, 2012. ^ Reed, Matt (January 18, 2011). "E-Verify best way to find illegals". Florida Today. Melbourne, Florida. p. 1B. Archived from the original on May 4, 2014. ^ King, Ledyard (April 27, 2014). "Some Florida Lawmakers took pricey but free trips in 2013". Florida Today. Melbourne, Florida. Retrieved April 27, 2014. ^ Millsap, Adam. "Big Metro Areas in Florida Keep Getting Bigger". Forbes.com. ^ "Local Government Vocabulary". Florida League of Cities. Archived from the original on November 10, 2013. Retrieved May 15, 2012. ^ Fishkind, Hank (November 9, 2013). "Beaches are critically important to us". Florida Today. Melbourne, Florida. pp. 4B. Retrieved November 11, 2013. ^ "Race, Hispanic or Latino, Age, and Housing Occupancy: 2010" Archived May 20, 2011, at the Wayback Machine. 2010 Census Redistricting Data (Public Law 94-171) Summary File. U.S. Census Bureau. Retrieved November 14, 2011. ^ a b c d "Florida Profile of General Population and Housing Characteristics: 2010 – 2010 Demographic Profile Data". factfinder.census.gov. Retrieved October 27, 2015. ^ a b c d "Florida: SELECTED SOCIAL CHARACTERISTICS IN THE UNITED STATES – 2006–2010 American Community Survey 5-Year Estimates". factfinder.census.gov. Retrieved October 27, 2015. ^ "Florida Factstreet". US Census Bureau. Archived from the original on November 20, 2010. Retrieved December 3, 2007. ^ Pulera, Dominic (October 20, 2004). "Sharing the Dream: White Males in Multicultural America". A&C Black. Retrieved October 23, 2018 – via Google Books. ^ "Ancestry of the Population by State: 1980 – Table 3" (PDF). Retrieved November 4, 2011. ^ "Historical Census Statistics on Population Totals By Race, 1790 to 1990, and By Hispanic Origin, 1970 to 1990, For The United States, Regions, Divisions, and States". U.S. Census Bureau. Archived from the original on December 24, 2014. Retrieved January 3, 2012. ^ "Miami, Florida Race and Hispanic or Latino Origin: 2010 – 2010 Census Summary File 1". American FactFinder. US Census Bureau. Retrieved October 27, 2015. ^ a b c "Florida Hispanic or Latino by Type: 2010 – 2010 Census Summary File 1". factfinder.census.gov. Archived from the original on November 29, 2014. Retrieved October 26, 2015. ^ Data Access and Dissemination Systems (DADS). "American FactFinder – Results". census.gov. Retrieved July 21, 2015. ^ "Thedailyjournal – Puerto Rico's population exodus is all about jobs". usatoday.com. Retrieved July 21, 2015. ^ Brinkmann, Paul. "How many Puerto Ricans have moved to Florida? State's numbers questioned". Orlandosentinel.com. ^ "Compendium of the Ninth Census:Population, with race" (PDF). US Census Bureau. p. 14. Archived (PDF) from the original on November 20, 2010. Retrieved December 3, 2007. ^ "Historical Census Browser: 1960 US Census". University of Virginia, Geospatial and Statistical Data Center. University of Virginia Library. 2004. Archived from the original on August 8, 2007. Retrieved August 29, 2008. ^ "As Caribbean immigration rises, Miami's black population becomes more foreign". Miamiherald.com. ^ "Grid View: Table B04006 – Census Reporter". censusreporter.org. ^ "Immigrants in Florida". Americanmigrationcouncil.org. January 1, 2015. ^ a b "Florida". Modern Language Association. Retrieved August 11, 2013. ^ MacDonald, Victoria M. (April 2004). "The Status of English Language Learners in Florida: Trends and Prospects" (PDF). Education Policy Research Unit, Arizona State University. Retrieved May 24, 2013. ^ "Religious Landscape Study". Pew Forum. May 11, 2015. ^ "Jewish Population of the United States, by State (2011)". Jewish Virtual Library. Retrieved September 13, 2013. ^ Pew Research Center, "Religious Landscape Study: Florida"
^ "Editorial:Culture of corruption". Florida Today. Melbourne, Florida. January 7, 2011. p. 1A. Archived from the original on January 7, 2014. ^ a b Leip, David. "General Election Results – Florida". United States Election Atlas. Retrieved November 18, 2016. ^ "Alabama : Federal Taxes Paid vs. Federal Spending Received : 1981–present" (PDF). Files.taxfoundation.org. Retrieved October 23, 2018. ^ "Voter Registration – Current by County – Division of Elections – Florida Department of State". October 24, 2016. Archived from the original on October 24, 2016. ^ Saxon, Wolfgang (October 27, 2003). "William C. Cramer, 81, a Leader of G.O.P. Resurgence in South". The New York Times. Retrieved February 26, 2008. ^ "Claude Roy Kirk, Jr". Office of Cultural and Historic Programs, State of Florida. Archived from the original on August 18, 2007. Retrieved February 26, 2008. ^ Thomas, Jr, Robert McG (May 23, 1996). "E. J. Gurney, 82, Senator Who Backed Nixon". The New York Times. Retrieved February 26, 2008. ^ a b Navarro, Mireya (September 21, 1998). "Florida's Split: Will It Play in the Panhandle?". The New York Times. Retrieved May 2, 2010. ^ Lengell, Sean. "As I-4 corridor goes, so goes Florida". The Washington Times. Archived from the original on November 20, 2010. ^ "Voter Registration by Party Affiliation and County". Florida Department of State. January 2008. Archived from the original on November 20, 2010. Retrieved February 26, 2008. ^ a b "U.S. Electoral College". Archived from the original on November 20, 2010. ^ a b "Florida Certificate of Vote". Archived from the original on November 20, 2010. ^ Pear, Robert. "Elections 2012, State Results". The New York Times. Retrieved April 15, 2013. ^ "Florida". 270towin.com. January 2, 2010. ^ See also Bush v. Palm Beach County Canvassing Board, 531 U.S. 70 (2000). ^ Fessenden, Ford; Broder, John M. (November 12, 2001). "Study of Disputed Florida Ballots Finds Justices Did Not Cast the Deciding Vote". The New York Times. ^ "Florida's Motor Vehicle : No-Fault Law : Report Number 2006-102" (PDF). Archive.flsenate.gov. Retrieved October 23, 2018. ^ "Personal Injury Protection (PIP)" (PDF). The Florida Senate, Committee on Banking and Insurance. August 2011. Retrieved February 9, 2012. ^ "Corruption at Miami-Dade auto accident clinics creates huge financial burden on drivers". United Auto Courts Report. United Auto Insurance Co. January 15, 2012. Retrieved February 9, 2012. ^ Deslatte, Aaron (January 26, 2012). "Scott says PIP program 'has to be fixed'". Orlando Sentinel. ^ Mitchell, Tia (January 25, 2012). "Scott-backed bill to combat fraud advances in House". Miami Herald. Archived from the original on February 11, 2012. ^ "House version of PIP reform gets Scott endorsement". Tampa Bay Times. January 25, 2012. Archived from the original on March 23, 2013. ^ Knapp, Andrew (October 16, 2010). "Crime rate decreases 5.5%". Melbourne, Florida: Florida Today. pp. 1B. ^ "The 2010 Florida Statutes". State of Florida. October 16, 2010. ^ Haridopolos, Mike (March 11, 2014). "Legislature aims to rewrite gaming rules. 'Complex' issue affects billions of dollars in state revenue". Florida Today. Melbourne, Florida. pp. 1A. Retrieved March 11, 2014. ^ a b The Florida Statutes. ^ a b "FL sentencing guidelines". FL Senate. ^ "Brickell Neighborhood Guide". Nestseekers.com. Archived from the original on June 29, 2009. Retrieved November 4, 2011. ^ "Brickell Real Estate – Millionaires Row". Miamisignaturehomes.com. Retrieved November 4, 2011. ^ "GDP, PPP (current international $) – Data". data.worldbank.org. ^ "News - renthomeflorida.com". renthomeflorida.com. ^ "Florida's September Employment Figures Released" (PDF). Lmsresources.labormarketinfo.com. September 2018. Retrieved October 23, 2018. ^ "State Exports from Florida". Census.gov. Retrieved October 23, 2018. ^ "Florida State Imports". Census.gov. Retrieved October 23, 2018. ^ "The Role of Metro Areas in the US Economy" (PDF). Archived from the original (PDF) on December 16, 2009. Retrieved November 4, 2011. ^ "MAPPED: Here's how many millionaires there are in each US state". Businesinsider.com. ^ "Site Selection Rankings". Greyhill Advisors. Retrieved October 18, 2011. ^ "Florida's Minimum Wage Rates". U.S. Department of Labor. October 15, 2009. Retrieved November 8, 2012. ^ Zhao, Helen (February 7, 2018). "These US cities have the highest credit card debt". Cnbc.com. ^ Chokey, Aric. "Poverty rate in Florida dips to lowest level since Great Recession, census says". Sun-sentinel.com. ^ PineapplePress. "The Two Henrys Henry Plant and Henry Flagler and Their Railroads – Pineapple Press". Pineapplepress.com. ^ Orr, Deborah (January 7, 2009). "America's 25 Weakest Housing Markets". Forbes. Archived from the original on January 22, 2009. Retrieved January 25, 2009. ^ "Our views:Playing with fire". Florida Today. March 20, 2009. Archived from the original on March 16, 2015. Retrieved March 22, 2009. ^ McCaffrey, Scott (October 15, 2009). "Census Bureau: 1 in 3 Virginians Pays Plenty for Housing". Arlington Sun Gazette. Archived from the original on November 20, 2010. Retrieved October 16, 2009. ^ Enrique, Eric (February 27, 2010). "No to noncourt foreclosures". Florida Today. Melbourne, Florida. p. 13A. Archived from the original on March 16, 2015. ^ Price, Wayne T. (March 24, 2010). "Area home sales down". Florida Today. Melbourne, Florida. p. 6C. Retrieved March 27, 2011. ^ "Interview: Guy Fieri talks new projects, criticism and the Triple D effect at Disney Springs in Orlando". Tampa Bay Times. February 13, 2017. Archived from the original on February 14, 2017. Retrieved February 14, 2017. ^ "Gov. Scott: Florida Sets Another Tourism Record". Florida Government. ^ a b "What They Are Saying... Florida Leaders Celebrate Record 105 Million Tourists in 2015". Government of Florida. Retrieved April 20, 2016. ^ Day, Ashley (March 6, 2016). "Florida shines brightly in spring". USA Today/Florida Today. Melbourne, Florida. pp. 3U. Retrieved March 6, 2016. ^ Jordan McPherson, February 24, 2018, Miami Herald, Stoneman Douglas shooting survivor to tourists: Boycott Florida unless gun legislation is passed, Retrieved February 26, 2018, "...DO NOT come to Florida for spring break unless gun legislation is passed," Hogg wrote in a post on Twitter..."
^ Waymer, Jim (February 15, 2010). "Beaches get pumped up". Florida Today. Melbourne, Florida. p. 13A. Archived from the original on February 17, 2010. ^ "Laying out an "unwelcome mat" to public beach access" (PDF). Archived from the original (PDF) on May 20, 2012. Retrieved November 4, 2011. ^ "10 Most Popular Theme Parks in the World – US City Traveler". Uscitytraveler.com. Retrieved October 23, 2018. ^ "Florida Theme Parks – Discover the Best Amusement Parks in Florida". Visit Florida. ^ Walton, Justin (October 13, 2015). "Florida's Economy: The 6 Industries Driving GDP Growth". Investopedia.com. 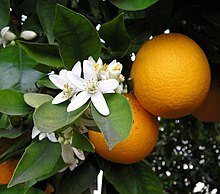 ^ "Commodity Profile: Citrus" (PDF). Agricultural Issues Center, University of California. Archived (PDF) from the original on February 22, 2010. Retrieved November 17, 2007. ^ Doering, Christopher (February 5, 2014). "Nelson lauds effect for state, Rubio opposes wide reach". Florida Today. Melbourne, Florida. p. 1A. Retrieved February 5, 2014. ^ "Crop Profile for Celery in Florida". NSF Center for Integrated Pest Management, North Carolina State University. Archived from the original on November 20, 2010. Retrieved November 17, 2007. ^ "Corn, Green Bean Prices Rise After Florida Freezes". Calorielab. January 1, 2011. 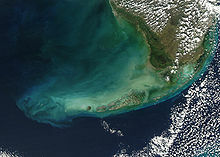 ^ "Pollutants threaten the Everglades' future". Earthmagazine.org. January 5, 2012. ^ Price, Wayne T. (February 23, 2010). "Locals to protest fish regulation". Florida Today. Melbourne, Florida. p. 8C. Archived from the original on February 7, 2015. ^ Moore, Mary Helen (October 8, 2018). "Berry poachers at heart of change in harvest rules". Florida Today. Melbourne, Florida. pp. 1A. Retrieved October 9, 2018. ^ Price, Wayne T. (February 10, 2015). "Sea Ray Boats to resume operations". Florida Today. Melbourne, Florida. p. 1A. Retrieved February 11, 2015. ^ "About Phosphate". The Mosaic Company. Archived from the original on September 23, 2007. Retrieved November 17, 2007. ^ "TSRI Plans to Open Major Science Center in Palm Beach County, Florida". News & Views. The Scripps Research Institute. October 2003. Retrieved May 14, 2012. ^ "State-by-State Listing of Major U.S. Military Bases – Florida". Archived from the original on November 20, 2010. Retrieved July 6, 2009. ^ Ash, Jim (April 15, 2009). "Military-friendly bill cruise". Florida Today. Melbourne, Florida. p. 9B. ^ Waymer, Jim (April 7, 2011). "Shutdown spares essential services". Florida Today. Melbourne, Florida. pp. 1A. Archived from the original on September 4, 2014. ^ "Study: Government a top employer in Florida". Florida Today. Melbourne, Florida. May 16, 2012. p. 12B. ^ Forgione, Mary. "World's busiest cruise ports are in Florida". latimes.com. ^ "Top 50 Water Ports by Tonnage – Bureau of Transportation Statistics". Bts.gov. ^ "Port Tampa Bay". Port Tampa Bay. ^ Hobson, Will (January 16, 2010). "County Medicaid tab rises, could get worse". The Miami Herald. Archived from the original on November 20, 2010. ^ Ryan, MacKenzie (December 26, 2010). "Qualifying for care a minefield" (PDF). Florida Today. Melbourne, Florida. p. 3A. Archived from the original (PDF) on December 5, 2010. ^ Marshal, James (December 26, 2010). "Sunday debate: No: Longtime official lost touch with voters". =Florida Today. Melbourne, Florida. p. 19A. Archived from the original on August 21, 2013. ^ "Opinion – Uninsured in Texas and Florida". The New York Times. Retrieved October 23, 2018.